If you are not a current member of House of Ruff, you will need to Join the Club, and your dog will need to go through our two-step Meet & Greet process before we can accept them as a boarder. The entire Meet & Greet process is waived for current Ruff Daycare members. Step 1 is waived for current Indoor Park members. Please contact us to schedule a Meet & Greet appointment. Prior to your appointment, please download and complete the Member Registration form, then email it to houseofruff@gmail.com. Assuming all goes well, we will then schedule the date for your dog’s first day at House of Ruff. 2. Your Dog’s Trial Run: Your dog’s first time at Ruff Daycare must be a half day minimum and considered a “trial run” dependent on his/her ability to socialize and participate with the pack. Doing so provides an opportunity to evaluate your dog’s comfort level and suitability for daycare. Upon pickup, we will provide you with an overview of your dog’s experience, share recommendations or concerns in respect to continued daycare service. 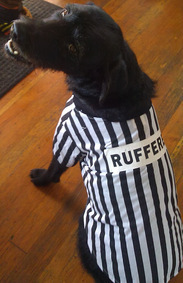 Your dog is then placed on a 30-day probationary period to confirm a good fit at House of Ruff. Note: If issues arise with your dog during the trial run (e.g., aggressive behavior to people or other dogs, extreme discomfort or nervousness), we may call you to pick him/her up earlier. All dogs must have a Membership Registration form on file, successfully passed the Behavioral Assessment, and has spent a minimum of one full day in House of Ruff daycare within 30 day of the boarding reservation. ​All dogs must wear a quick-release collar with a name tag and must be on a leash upon entry and departure. Overnight Boarding Rates are quoted for 24-hr care between drop-off and pickup times. Examples: Drop-off at 8 AM includes daycare and boarding until 8 AM the next day. Drop-off at 6 PM includes boarding and daycare until 6 PM the next day. Boarding dogs must be dropped off no later than 2 hours prior to closing! 6 PM Monday thru Friday, after 5 PM Saturday or 4 PM Sunday. Cancellations not made within 24 hrs of scheduled stay will be subject to a fee of 25% of the value of the scheduled stay. Grain-free food is available for $4/meal. However, we encourage you to bring the food they are accustomed to in a container labeled with their name and feeding instructions. * If your dog's vaccinations are not up to date, House of Ruff recommends you contact Urban Animal. They are a walk-in clinic conveniently located 1-1/2 miles away and do not require an appointment. 1-2-3 Membership Registration: 1. Review our services and review Ruff Motel Rules & Policies. 2. Click on Join the Club to download and complete your Membership Registration form. 3. Call 206-325-3476 to schedule your Meet & Greet appointment today!